I always knew I was adopted. In our house, it was more of a stated fact than something we talked about. As I stated in my last blog, it really was just a part of who I was. I really don't remember a defining moment or some teary-eyed time that it was realized. As best I can, I’m going to try to recant my story about the search for my identity - it was over 25 years ago so the details are a little fuzzy (too bad this way of journaling wasn’t around then). In most States, closed adoption records (which mine was) are sealed. The adoptee, birth parents, and adoptive parents are required to follow certain procedures established by the State to acquire identifying information from the adoption records. 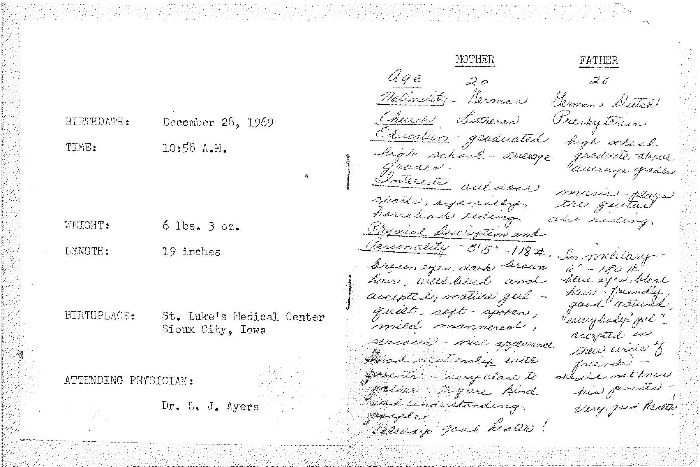 The one item I had was a little pink leaflet that contained nonidentifying information about both birth parents. This was provided from the agency that arranged the adoption. When I was 15, I contacted the agency where I was adopted and was told that at age 18 I would be able to inquire about my origins. The agency would facilitate the search. They would first check my “folder” and see if my birth mother had contact with the agency since my birth and if so – it could be an easy “connection case”. They also instructed me to begin by writing a letter to my birth mom containing absolutely no identifying information and no matter the outcome of my case, that letter would be forwarded to her…and with that information the “search” began. I sat down and tried to imagine what words I could write to my birth mother that would explain who I was, what my life has been like or convince her to accept contact from me if she had chosen not to when the agency contacted her. I wanted her to know I was a good student in school and that I played sports (I loved all sports but especially softball) and that I grew up with two brothers and loved my parents very much. In my mind, I also knew the person I was and that I was a product of her so deep down – I knew she would agree to contact. BUT – the agency had to do their job of attempting to prepare me that the person who was my birth mom could be a prostitute who lived on the streets or just someone who considered this was the past and a part of their life they were not willing to deal with which would result in not want any contact with me. So after writing, erasing, re-reading, throwing away and starting over time after time…the letter was written and finished .I certainly didn’t want to take the chance of it being lost in the US mail so guess what? I drove 30 miles to drop in with the agency. When I turned 18, I was hoping for a switch to be turned on and magically the search would begin. I called weekly to make sure my caseworker knew I was still interested and wasn’t giving up. In all honesty, I was very annoyed by the amount of time the caseworker put toward MY case. To me, it didn’t matter what her caseload was, how many others there were or any other details. I was focused on one thing and one thing only - the outcome of MY case. When she first reviewed the file, she said that because there were a lot of siblings that hopefully it would not be hard to locate her. So what was taking so long? I truly wondered how this ONE person could be controlling and affecting someone’s life this way. Didn’t she realize how important this was to ME? Over the next year and half, I moved away from the area. I was working and going to school which occupied my time quite well. I went from checking in with the agency once a week to probably once a month. I had several conversations with different people at my place of employment and one day a guy named Gary overheard me say that I was adopted. Turns out – he was too and we shared our stories etc. I revealed to him that I was currently searching and explained to him what that process entailed. As time went on, we’d see each other in passing and he always asked if there was an update and to my despair the answer was no. I believe it was a Thursday that I had came home from class and was changing clothes to go to work when I noticed there was a message on my machine. It was my case worker. I stood stiff as a board in disbelief because it was her calling me instead of me calling her. I had prayed for this and here it was staring me in the face. She relayed information that she had made contact with my birth grandmother and that she was now contacting my birth mom. When she heard from her, I’d be alerted. I thanked her for the call and hung up. Is this really happening? I hurried to work and prayed I’d see Gary as I wanted to scream out loud about the recent revelations. I didn’t see him that day but I did tell everyone that would listen to me! Within the next several days, I heard from the agency who informed me they had made contact with my birth mother, Anita, and she was willing to have contact. I was seriously convulsing and my mind was racing. I did have the wherewithal to ask “what next”? The agency replied that the letter I had written three years prior would be forwarded to her (gosh – I wondered what exactly I had put in that letter and so many things had changed since that was written. I had more I wanted to say). Anita would then have the option of writing back. If she did – she would send her letter to the agency where they would take it out of the original envelope, read it to make sure there was no identifying information in the letters content and then forward onto me. This would ensure no postmark or any identifying information would be exchanged and confidentiality would remain intact in case either party wanted to back out at anytime. My first interactions will be in my next post.